We have extended the video submission deadline by one week, to 27.11.2012. 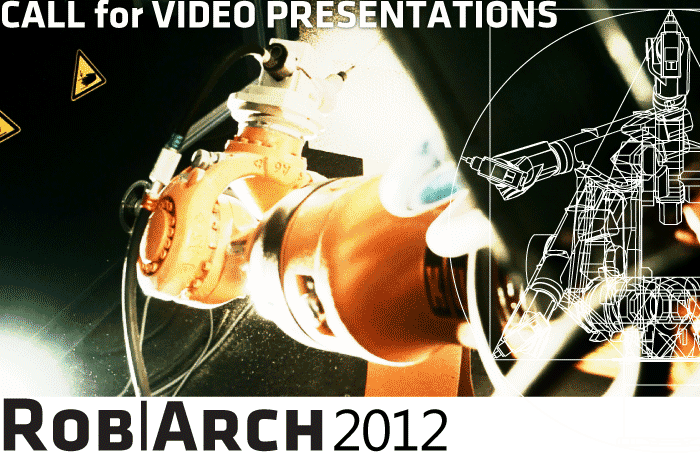 Please upload your submissions via videosubmission.robarch2012.org. See here for more details! ETH Zurich and ROB Technologies have provided use with a teaser video for their upcoming Brickdesign workshop at Rob|Arch 2012. Enjoy! 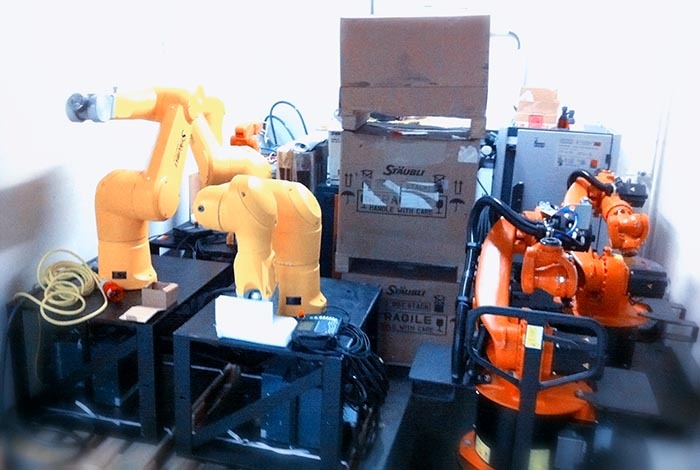 We’re glad to announce that the final batch of robots has arrived in Vienna, three Staeubli TX90 robots, ranging from normal size to the XL variant, which will be used for the SciArc workshop at Rob|Arch. The ABB IRB 120 for Thibault Schwartz’ workshop already arrived a while ago. The Association’s KR16-2 aren’t on workshop duty, but will exhibited at the conference as well. While the workshops in Vienna are nearly fully booked out, there are still some places left e.g. for Graz, which is connected to Vienna by a direct 2.5h train connection. 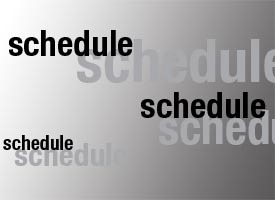 The preliminary schedule is now available for download here. 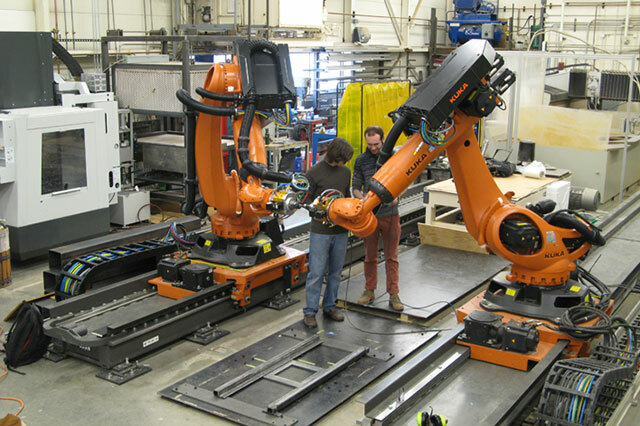 The workshop explores novel approaches to serially customized casting processes enabled through the strategic deployment of three 6-axis robotic manipulators. 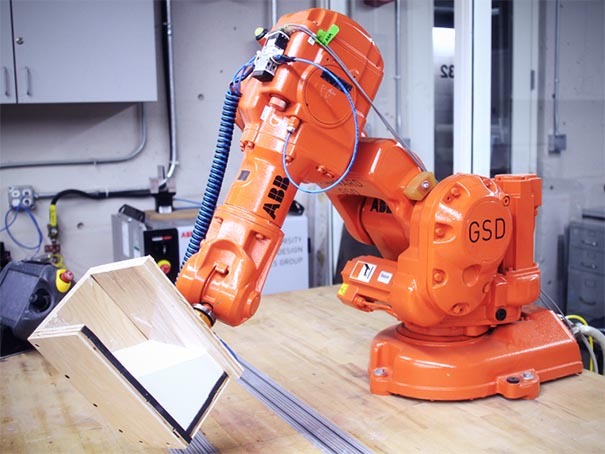 Combining bottom up and top down design approaches, the workshop includes the design and fabrication of robotic molds geared towards the production of customizable structural components. The workshop production process takes full advantage of the robots ability to precisely choreograph the mold position in space and time. The production will generate a controlled yet infinitely variable family of structural modules that combine into a larger physical prototype. We are glad to inform you, that the author notifications have now been sent out. 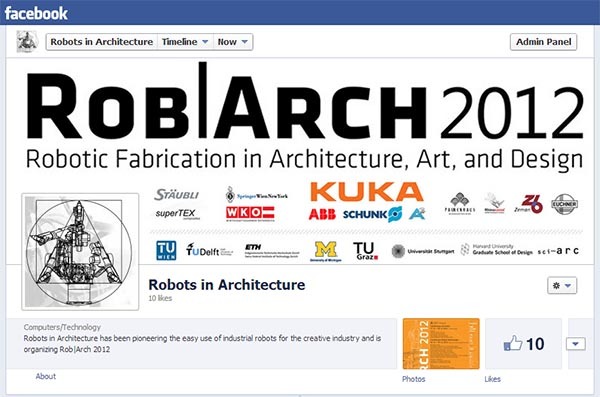 If you have not received an eMail, please check your spam folder and contact chair@robarch2012.org. 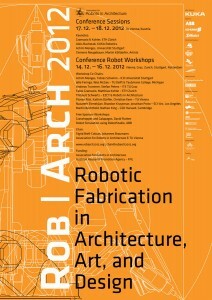 Furthermore, the registrations for the free sponsor workshops are now open at the registration.robarch2012.org. These workshops are provided by our sponsors McNeel and ABB free of charge for conference attendees. In the McNeel workshop, Grasshopper developer David Rutten will provide insight into Grasshopper, while the ABB workshop will expose attendants to the robot programming software RobotStudio. Seats are limited and only available for registered conferences attendees. 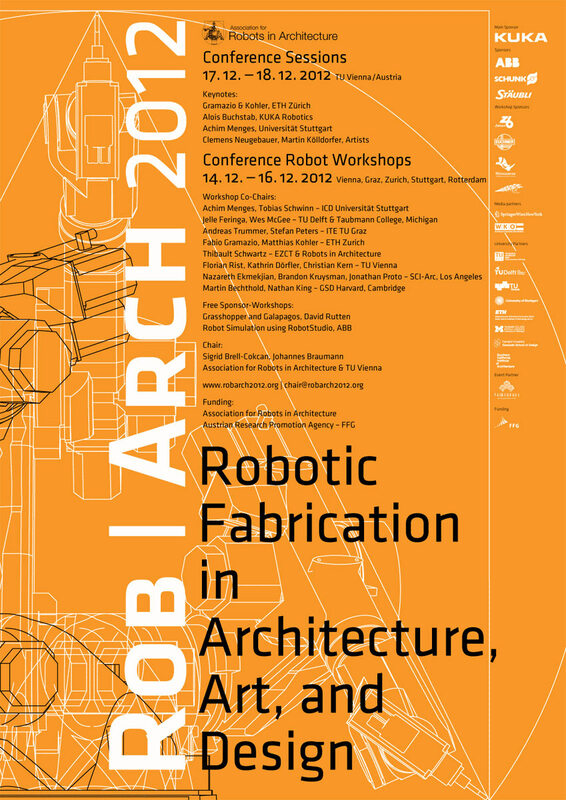 The registration page now also offers a conference only registration, though we strongly recommend everyone to take a workshop, as they offer a unique chance to get a look at today’s cutting edge robotic research institutions. Finally, we have partnered up with the ACADIA conference, which will take place in San Francisco from October 18th to 21st. 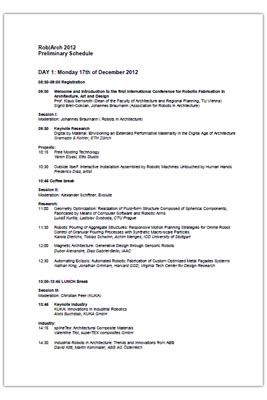 This year’s topic is “Synthetic Digital Ecologies” and promises some very interesting keynotes and presentations. Abstracts must be submitted as PDFs using the Paper Submission form and have to be completely blinded. Abstracts should be no more than 2 A4 pages including figures and at least four references. The template for the final papers will be made available in the next weeks, there is no template required for the abstract submission. If you haven’t done so already, go here and register for a user account by entering your preferred username and eMail address. You will receive the password for your account immediately via eMail. 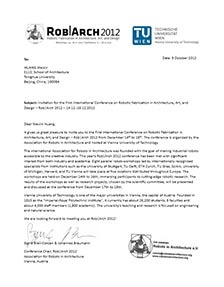 The KUKA Young Potential Award, kindly funded by KUKA, will cover travel expenses and workshop/conference admission fees of up to 2000€ for the author of the best scientific paper at Rob|Arch 2012. All paper authors under 35 years automatically qualify for the award. Finalists are selected by the scientific committee and the winner is announced at the conference in Vienna. 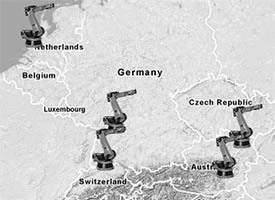 For the first time, ROB|ARCH 2012 will bring together international university partners who will open their robotic research labs to a creative use and present an insight in their applied robotic research at various locations throughout Europe. 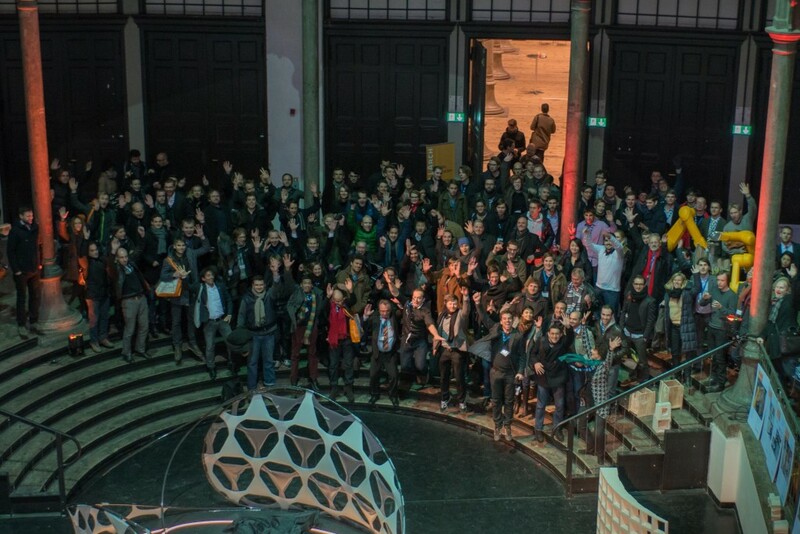 While the international workshops will be distributed at university partners, the following conference will take place in Vienna, a city well known for its living quality, but also a hotspot for technology and innovation. 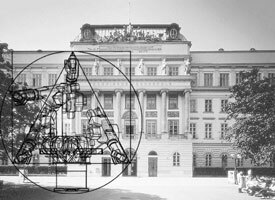 We invite authors to submit papers with original research relating to the use of robots in architecture, art, and design. 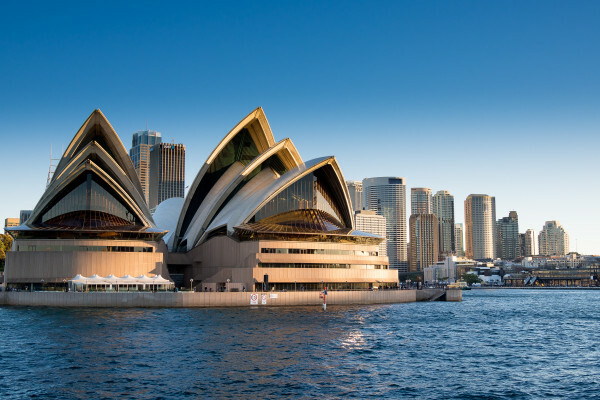 An international scientific committee consisting of researchers and practising architects will evaluate the papers and provide feedback to the authors. The selected papers are published in the Springer proceedings and presented at the conference in Vienna.